Rick Brassard, Board chair, presents Colleen Landers with a memento from her colleagues on the Board for her milestone accomplishment of 25 years of service as Catholic Trustee. 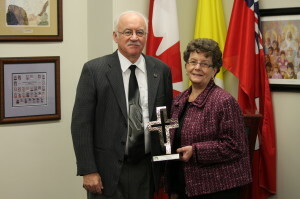 Colleen Landers, current OCSTA Director and trustee with the Northeastern Catholic District School Board was recently honoured by her board for 25 years of service as a Catholic School Board Trustee. 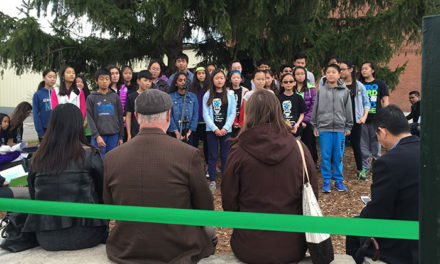 Mrs. Landers was first elected in 1988 to the Timmins English Catholic Board and has served as Vice-Chair and Chair of the Board of Trustees over the years. In addition to supporting Catholic education for students at the Northeastern CDSB, Mrs. Landers advocates provincially for Catholic education as the regionally elected Region 1 Representative on the Board of Directors for the Ontario Catholic School Trustees’ Association (OCSTA). Mrs. Landers has served as an OCSTA Director since 2010. 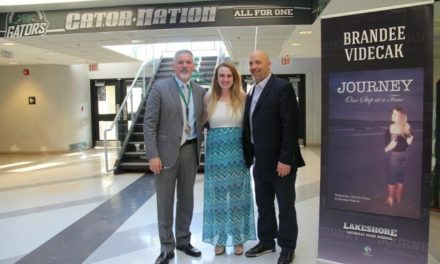 In addition to her provincial role, since 2009 Mrs. Landers has represented the interests of Ontario Catholic school boards as a national advocate on the Board of Directors of the Canadian Catholic School Trustees’ Association. “I am honoured to have served the Catholic community for the past 25 years and I thank the Timmins Catholic ratepayers for their support. 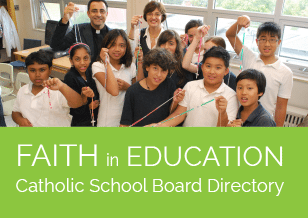 I believe every child has the right to a Catholic education and I enjoy what I do as a Catholic Trustee for the Northeastern Catholic District School Board. I thank my fellow trustees and administration for honoring me for this milestone in my career,” said Mrs. Landers.